Slack is an online instant messaging and collaboration tool used by over one million users. One of its compelling innovations is the ability to integrate a wide variety of applications to all go to Slack. 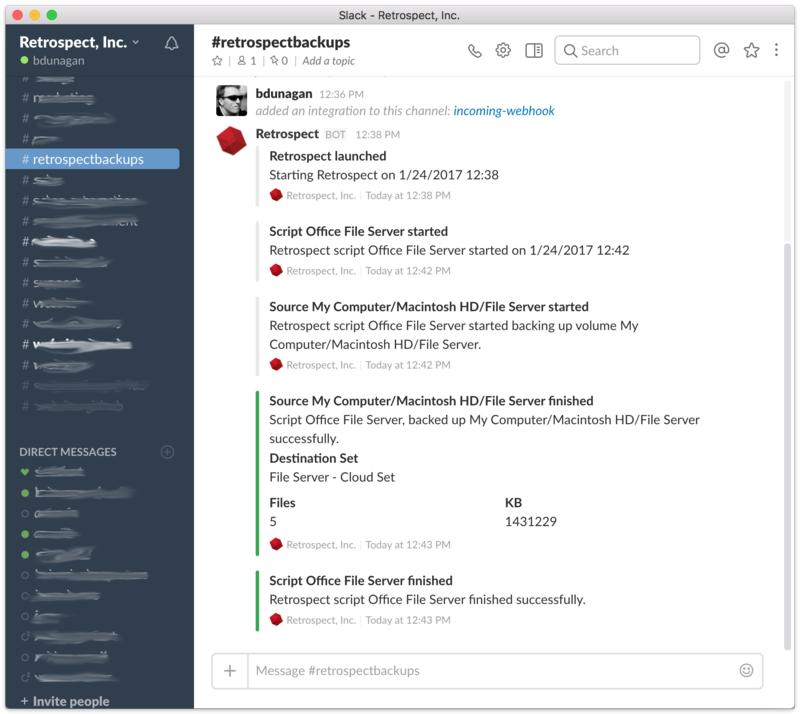 With Script Hooks, you can monitor Retrospect from Slack as well. Download the example Retrospect script hooks from our website. You will need to set up a Slack web integration to get a URL to replace the placeholder above with. This document assumes you already have a Slack account. If you do not, you can set one up for free at https://slack.com/. Once you do, you will need to create a new incoming WebHook. This will create a URL that Retrospect (or more correctly, the Slack retroEventHandler) can send its messages to. The only requirement here is to pick which Slack channel you wish Retrospect’s notifications to go to. Once you choose Add Incoming WebHooks integration, you will get a screen like the one below with a WebHook URL. Copy this URL into the Slack Retrospect eventhandler in place of the https://hooks.slack.com/services/Txxxxxxxx/Bxxxxxxxx/xxxxxxxxxxxxxxxxxxxxxxxx text. Save the file. You are now done. You do not need to restart the Retrospect engine or application for it to start using the script. retroEventHandler "StartApp" "2/10/2017 12:01 AM" "true"
If there are any errors, they should display in the terminal or cmd window and point you toward a solution.